Recipe extract from Carina’s Scots Magazine Column. Full article out in shops now. 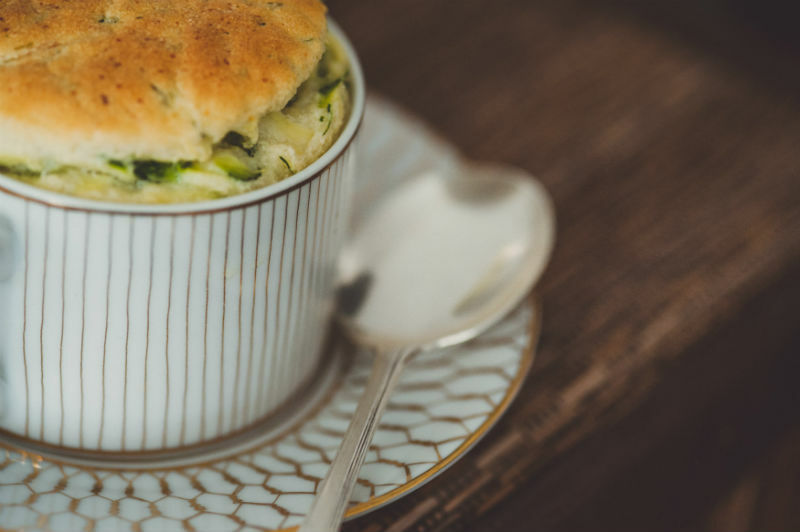 What could be more fancy french than a souffle. The lovely Errington family are our food heroes and their beautiful Lanark Blue is made to the same style as that very famous french cheese Roquefort. A lovely French Scots combination. Preheat the oven to 180oC/350oF/Gas 4 and grease 6 individual 150ml ramekins. Coarsely grate the courgettes and leave in a colander in the sink with a generous pinch of salt. Melt the butter in a pan over a medium heat, then add the flour and nutmeg. Reduce the heat and cook, stirring frequently, for 4–5 minutes, then add the milk. Season to taste with salt and pepper. Continue cooking until the mixture has thickened, stirring with a balloon whisk to help prevent lumps forming. Add the egg yolks and beat until smooth. With the heat very low, add the Lanark Blue and beat again until smooth and thickened. Remove from the heat. Divide between the greased ramekins and set in a bain-marie. Bake for about 25 minutes in the preheated oven, until light, risen and golden. Serve immediately.